Research into flood resilience in Newcastle is making waves already according to findings presented at a conference in the city. Following the signing of the Newcastle Blue-Green Declaration in February 2016, the Urban Flood Resilience Consortium, led by the University of Nottingham, met last week to present key findings from two research projects (Blue-Green Cities and Urban Flood Resilience) to an audience of practitioners, policy makers and academics. The Blue-Green Cities and Urban Flood Resilience research projects have already produced world-class research outputs demonstrating the multiple benefits of Blue-Green infrastructure (including rain gardens, swales, green roofs, wetlands and stormwater ponds), resilience of urban water systems under climate and population change, opportunities to use stormwater as a resource, citizens’ interactions and interoperability of Blue-Green systems. Newcastle has been a focus for these projects. The Consortium has been looking at how local partners, including Newcastle City Council, Northumbrian Water, the Environment Agency, and Newcastle University, can help tackle flood risk and climate change, and deliver other social, economic and environmental benefits. This latest conference, which took place at the Newcastle Centre for Life on 7 March, showcased progress with implementation of Blue-Green infrastructure in Newcastle and the wider North East, since the signing of the Declaration in 2016. Progress includes the new surface water management scheme in Killingworth and Longbenton, a partnership project between Northumbrian Water, the Environment Agency and North Tyneside Council, that uses Blue-Green infrastructure to mimic nature, enhance biodiversity and habitats, improve water quality, manage flood risk and enable sustainable development. Blue-Green infrastructure is also a key component of the Newcastle Local Flood Risk Management Plan (March 2016) and Newcastle City Council are committed to “managing flooding in a more natural way whilst still obtaining the benefits from using green infrastructure for the benefit of the environment, our residents and visitors and the economy” (Foreword by Cllr Jed Bell). Professor Colin Thorne, from the School of Geography at the University of Nottingham, is leading on the research. He said: “The ‘Toon Monsoon’ was a disaster that flooded much of central Newcastle and caused tens of millions of pounds of damage, but it was also a catalyst for change. Between 2013 and 2016, the ‘Blue-Green Cities’ research consortium led by the University of Nottingham worked together to identify a path to sustainable flood management and in February 2016 the City Council, Northumbrian Water, the Environment Agency and other key stakeholders declared their intention to make Newcastle a ‘Blue-Green City’. 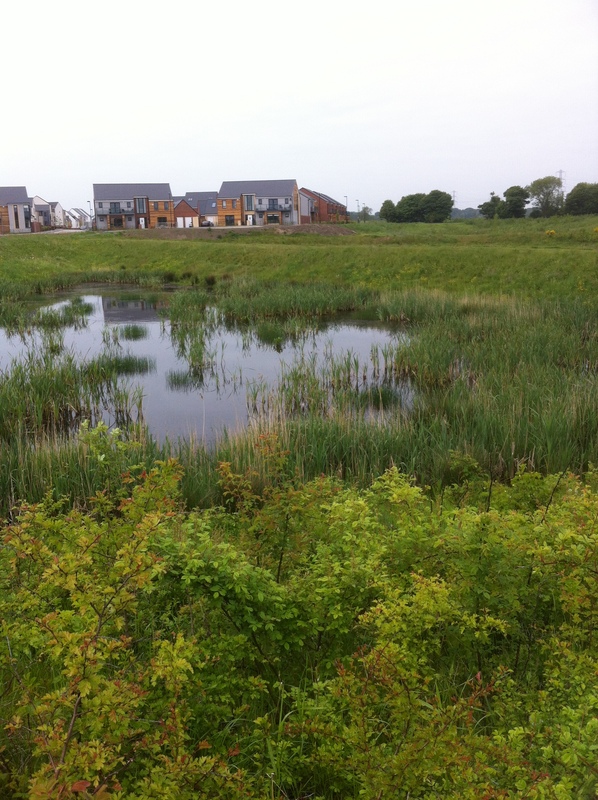 New signatories, including the Royal Town Planning Institute (RTPI) and Groundwork NE & Cumbria, pledged to collaborate on Blue-Green infrastructure projects and raise awareness of these approaches to flood and water management. A 2019 Blue-Green Declaration was launched. Dr Emily O’Donnell, also from the School of Geography at the University of Nottingham, coordinates the Newcastle Learning and Action Alliance. She said: “Learning and Action Alliances have emerged in response to increasingly louder calls for integrative solutions to problems that cannot be solved by science or traditional top-down governance alone, such as sustainable flood risk management. The Newcastle Learning and Action Alliance has been incredibly effective at bringing stakeholders together and giving them a platform to discuss innovative Blue-Green infrastructure strategies. Feedback from Learning and Action Alliance members has also helped ensure that our research outputs have relevance in practice and policy making”. The Urban Flood resilience project is a £1.7m project funded by the Engineering and Physical Sciences Research Council. The Urban Flood Resilience Consortium includes academics from the University of Nottingham, University of Exeter, Heriot-Watt University, Newcastle University, University of Leeds, University of the West of England, University of Cambridge, The Open University, and Nottingham Trent University.